(The second leg of this business trip brings me to Hong Kong. In the middle of the week I will go to Beijing for a few days). The combination of the dovish signals from the European Central Bank and the rate cut by the People’s Bank of China lifted the US dollar just as it was threatening to fall through the lower end of its recent ranges. Judging from the positioning in the futures market, short-term speculators appeared to be abandoning the dollar bull camp, perhaps driven the disappointment with the Federal Reserve’s seeming inability to move away from the zero-bound six years into an economic recovery that has driven the unemployment rate to 5.1%. The price action underscores that the divergence meme that is central to our bullish US dollar scenario is not only driven by the timing of the Fed’s lift-off but by what other central banks are doing and going to do. The divergence has not peaked. Nor will it peak for at least the next year. It also does not do justice to the way financial markets work to suggest that that has been fully discounted. After all, the widening interest rate differentials create an incentive structure for new portfolio and direct investment flows and hedging. The US dollar has been moving broadly sideways after rallying earlier this year. The extreme long dollar positioning has been alleviated, and the over-extended technical condition has been corrected. With the fundamentals and technicals aligned, the dollar may be arguably in its best position to appreciate in several months. However, with significant gains last Thursday and Friday, and ahead of the BOJ and FOMC meetings, some consolidation should not be unexpected. To say that the BOJ is most likely to stand pat is to obscure the fact that it continues to pursue an aggressive, unorthodox monetary policy, which includes buying nearly the entire new supply of JGBs. The Federal Reserve is unlikely to say anything that can be construed as closing the door to a December rate hike. However, both events pose risks and after substantial moves in two sessions may limit the willingness of taking on new exposures. The euro’s technical condition deteriorated markedly. The mild uptrend line, drawn off the March, April and August's lows, was convincingly violated. The five- and 20-day moving averages crossed, and there were consecutive closes below the 200-day moving average. It finished the week below the shelf carved near $1.1080. The various technical indicators, like the RSI, MACDs, and Stochastics, have broken down. A caveat is that the pace of the euro’s drop has pushed it below the lower Bollinger Band (~$1.1065). Short-term momentum traders may see a move back above there as a sign to move to the sidelines. The euro dropped three cents last week. It is hard to see that being repeated in the next week, though a recovery in jobs growth, back above 200k, the following week could bring the risk of a dramatic divergence drama in December. A fortnight after the ECB expands in some fashion its unorthodox monetary policy, the Federal Reserve could raise rates. Specifically, the $1.0940 area is the 61.8% retracement of the euro’s bounce off the March lows, and beyond that is $1.0800. In contrast to the euro’s breakdown, the yen moved from the top end of its range to the bottom end. It has not convincingly broken out. To do so the dollar needs to establish a foothold above JPY122.00-JPY122.20. The technicals are encouraging. However, here too the move was sufficiently sharp that the greenback closed above the top Bollinger Band (~JPY121.05). 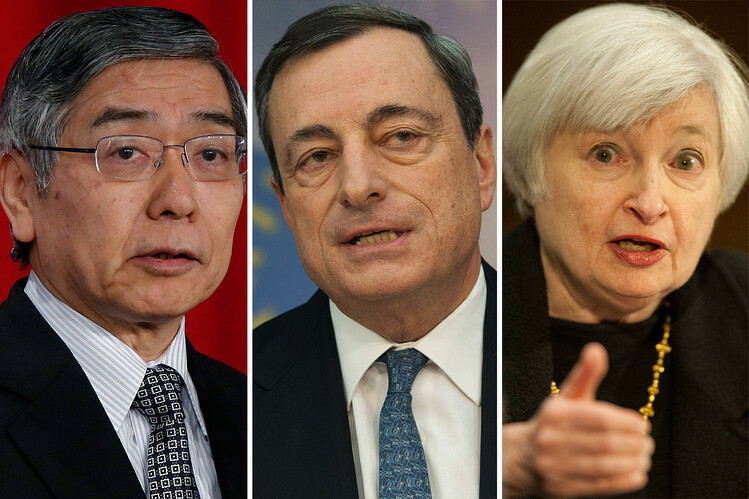 The dollar was trading a little below JPY120 before Draghi’s dovish comments hit the wires. It was trading a little above JPY120.50 when the PBOC announced its rate and required reserve cuts. While a push back to JPY121 would not be surprising, a break of the JPY120.50 area reinforces the existing range that has prevailed since late August. The dollar bottomed against the yen on October 15 near JPY118.00. While it advanced 3.5 yen, the US 10-year Treasury yield has risen 12 bp, and the S&P 500 has gained 4%. A break out of the dollar to the upside would likely take place alongside a continued rally in the S&P 500 and backing up of US bond yields. The S&P 500, and global equities, in general, posted strong gains last week. The technical picture is constructive, encouraged by the growing conviction that the global peak in central bank accommodation is still ahead of us. October has been a good month for equities. The S&P 500 is having its best month in a few years; advancing 8% going into the last week of October. The Nikkei is up a fraction more while the DAX and Shanghai Composite are up 11.75%. After recovering smartly off the retest of the August lows in late-September, the upside momentum in the S&P 500 appeared to have begun stalling before the Draghi’s dovishness. However, the anticipation of further easing helped propel the S&P 500 through the 61.8% retracement of the correction from the peak in late-May (~2132). The S&P 500 gapped higher before the weekend. It is found between October 22 high of 2055.20 and October 23 low of 2058.19. Given the location of the gap, it is most likely a normal gap, meaning that it will likely be filled in the near-term. If it is a measuring gap instead, it could project gains toward back toward the record high. The most bearish development would be a gap lower opening that would make it a bearish exhaustion gap, but the other technical indicators do not support this scenario. US 10-year bond yields closed the week on firm footing a hair below 2.09%. The technical indicators favor a further increase, and the five-day average is above to cross above the 20-day average. Overcoming the 2.11%-2.15% band would signal a retest on the mid-September high near 2.30%. Sterling lost two cents against the dollar last Thursday and Friday to almost $1.53. It had repeatedly tried in vain before the ECB meeting to break $1.55. The trendline drawn off the month’s low came in near $1.5285 at the end of last week and $1.5355 at the end of next week. A break could spark a quick move to $1.52 and maybe a bit further. The euro dropped against sterling. On October 13, the euro was at eight-month highs near GBP0.7500. Last week it finished below GBP0.7200. It spent the entire session before the weekend below its lower Bollinger Band (~GBP0.7240) for the first time since June 2014. Indeed, it neared three standard deviations from its 20-day moving average (~GBP0.7175). A move back toward the Bollinger Band will likely be sold. The GBP0.7150 area corresponds to a 61.8% retracement of the euro’s gains since the summer, and a break may encourage the anticipation of a return to those lows set near GBP0.6935. The unexpected election of a Liberal majority government changes the policy mix in Canada. Fiscal policy will shift from a small surplus to a small deficit. It may take some pressure off monetary policy though with the economy recovering after the difficult first half, the Bank of Canada’s mini-easing cycle was likely over before the electoral outcome. The Canadian dollar lost nearly two percent against the US dollar last week. The slightly softer than expected inflation readings before the weekend, and the softer oil prices took a toll. The US dollar recorded an outside up day (trading on both sides of the previous day’s range and closing above its high). The five-day average is poised to cross above the 20-day average at the start of the new week. A move above CAD1.3220, which is the 61.8% retracement of the US dollar’s decline since it reached an 11-year high at the end of September (~CAD1.3460). The weakness of the Canadian dollar is coinciding with a renewed widening of the US premium over Canada on two-year debt. The premium had nearly disappeared in the middle of the month but finished last week at 10 bp, it best levels since the start of the month. The Canadian dollar’s heavier tone also coincided with new weakness in oil prices. The December light sweet crude oil futures contract finished last week at its lowest level in two months. However, it did not break out of its trading range. That requires follow through selling. Further losses could signal a break of a neckline of a double top pattern. The measuring objective suggests a retest on the lows seen in the third week of August near $39. A break of $43.80 will expose the downside. The technical indicators favor the downside. There is a steep downtrend line drawn from the October 9 high has caught the highs. It came in near $46 before the weekend, and will be about $43.20 at the end of the month. The New Zealand dollar is the strongest of the major currencies so far here in October, gaining 5.5% against the US dollar. The Australian dollar is a distant second at a little more than half of the Kiwi’s gain. The Reserve Bank of New Zealand cannot welcome the Kiwi’s appreciation and may express its disapproval at the policy meeting this week. On a trade-weighted basis, it has risen by almost 8% since early September to reach a four-month high. The upside momentum has begun to ease, and it appears particularly vulnerable from a technical perspective. The initial target is near $0.6600. The Australian dollar has been resilient to the resurging US dollar. Cross rate demand against the euro may have helped mitigate the impact of the heighten speculation of a rate cut next month to offset the tightening of financial conditions following the top banks increase in (variable rate) mortgages. The Australian dollar has drifted lower, but it has not traded below its 20-day moving average since October 6. A break of the $0.7160-$0.7180 area would sour the technical tone while if $0.7100 is given, it could signal the end of the multi-week correction and the resumption of the longer-term downtrend. A retest of the lows (~$0.6900) would be the initial objective.